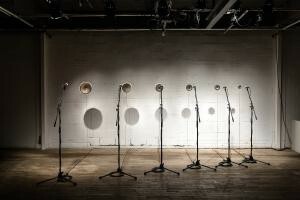 Adam Basanta’s installation “The sound of empty space” explores relationships between microphones, speakers, and surrounding acoustic environment through controlled, self-generating microphone feedback. By amplifying and aestheticizing the acoustic inactivity between technological “inputs” and “outputs” – stand-ins for their corporeal correlates, the ear and mouth – the notion of causal sound producing object is refuted; we are listening to the empty space between components of flawed communication systems. Through a series of new, interrelated works, sound is revealed not as an object or autonomous event, but a product of a complex, interdependent system of relations. Don’t miss the vernissage for Basanta’s installation held on February 19, 5:30pm at Galerie B312. The installation will be on display from February 19 to March 21. RSVP to the Facebook page here.